"Hollywood Squid," by Oliver Buckram [bio] (edited by C.C. 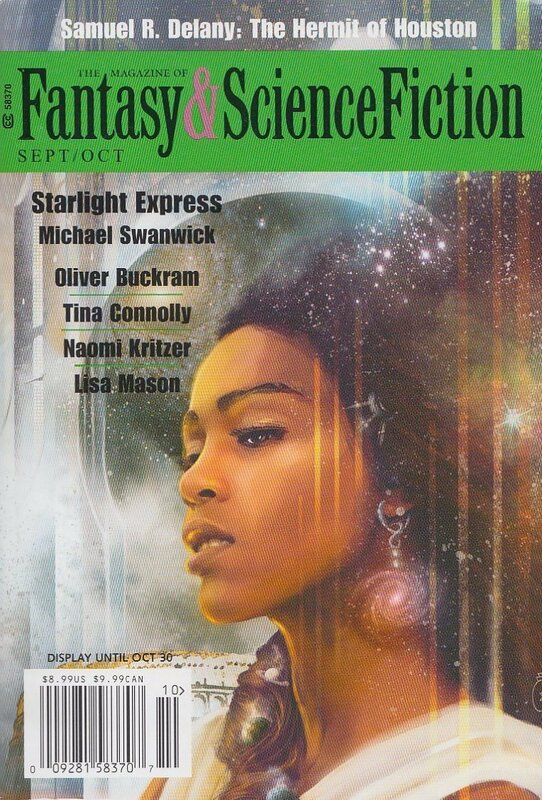 Finlay), appeared in Magazine of Fantasy & Science Fiction issue 09-10|17, published on September 1, 2017 by Spilogale Inc. Pro: Of course this is the story of how Big House made his big comeback. But it’s also how Eppie showed that squids could fit into human society by channeling their desire to mislead into honest fiction. The story does a great job of developing both characters, and by the big moment, we’re anxious for them both to succeed. The fact that we can’t be sure Eppie isn’t setting Tony up adds a lot of tension all the way up to the moment when he smashes the award and the diamonds come out. Then it’s powerfully moving because Tony did it based on his faith in Eppie’s friendship—learning that that faith was not misplaced was just as important as finding the diamonds. Casa grande literally means “Big House” in Spanish. The title is probably a reference to Margret Atwood's claim that science fiction was nothing more than "talking squids in outer space." Con: It’s hard to see how helping expose a diamond-smuggling ring helps a director get funding for a movie. A great read. Hilarious like the best from Fredric Brown but also makes us care for the characters. Casagrande feels tridimensional and we get to reach Eppie, despite his alien nature. Laughts galore but essential bits of drama and even tragedy are present as well. Will Casagrande be able to end in a dignified way while he faces the sunset? Will Eppie be able to create his masterwork? It is easy to imagine the soundtrack from Beverly Hills Cop in the background in the final section of the story. The end works in multiple levels, very satisfactorily. There are clues enough for the reader to suggest but not to impose (so that the final effect is stronger). All in all, This story shows a very solid writer. My next band name will be Alien Episcopalian! So funny and clever!